Many Christians have grown up in the church on moralistic preaching; that is, preaching that calls for obedience without connecting the commands of God to the cross of Christ. This disconnect is dangerous, potentially leading hearers into either self-loathing or self-righteousness. Moralistic preaching is often the ground in which the devil sows the seeds of legalism. 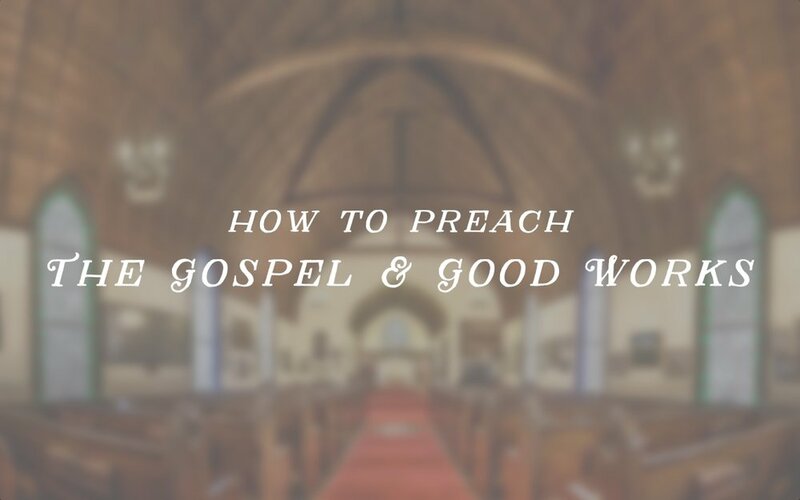 Of course biblical preaching will always be relevant and call for a response, but how can we preach the commands of God without reducing our messages to moralism? Is the key to simply jump from the command "pray without ceasing" to the reality that Jesus suffered a vicarious, penal atonement? Well, that's one way to do it. But, let me suggest three ways of preaching the commands of God that help us avoid the trap of moralism. God's laws are not arbitrary, but stem from who he is. And, because we are made in his image and for his glory, he gives us commands that reflect his character. So, when holding out the commands of God we must point beyond the command to the God who gives it. For example, God commands us to be holy, because he is holy. He commands us to speak the truth and not bear false witness against our neighbor, because he is a God of truth who cannot lie. He commands us to be faithful, for he trustworthy and keeps his word. He calls us to love, because he is love. Naked commands, separated from the character of God, lack both weight and compelling beauty. Showing the God of the command moves us from preaching moralism to unpacking theology. It moves us beyond the command to the God who gives it. It is important to note, when speaking to believers, that the commands of God are given to his people who live in a covenant relationship with him by grace. When the Lord gives Israel the law he first establishes who he is and what he has done for them, saying, “I am the LORD your God, who brought you out of the land of Egypt, out of the house of slavery." (Exodus 20:2 ESV) He is the God who has rescued his people. He is our God. We must always remind our people (and first, ourselves) that God commands us to act---not that we might become good, but that we might know and show him to be good. God does not reveal his will so that we can build our confidence in our ability to keep it, but so that we can exalt and exult in the God we know by grace. Showing the grace behind the command moves us from fearful performance-based religion to a delight in the will and ways of God. The commands of God are pure and beautiful. They are a perfect reflection of his character and will, and we stand in stark contrast to that revelation. We are spiritual failures who could be justly condemned for our sin. But, our failure is not the end. Jesus has fully atoned for our sins through his death on the cross, and by it we are reconciled to God. Not only has God forgiven us of our unrighteousness, but he has given us the righteousness of Jesus, declaring that in him we are holy and blameless. In every point where we have failed, Jesus has been faithful. In this very command, Jesus was not only righteous, but was righteous for us. The good news of the gospel is that in Christ we are not only delivered rom the curse of the law, but also empowered by God to keep it. Relatively. We remain sinners, and find ourselves unable to loose ourselves from sin's presence this side of the resurrection, but God is at work in his people to enable us to walk in his ways. You really can live a godly life. One in which you acknowledge and repent of your sin, and submit yourself to will and ways of God through power that comes by the Holy Spirit. So yes, we can and must preach the whole counsel of God. We must call men and women to obey, but not for approval, nor apart from the truth of the God who gives and fulfills the law for us. I believe if we do this when teaching the commands of God we kill moralism and will, by the grace of God, see conviction and encouragement among the people.